The perfect overhead truck canopy removal and storage option for your garage or shop. Flexible design allows it to work for factory truck caps, aftermarket truck accessories and pickup truck bed covers. In fact, you can use it to store almost anything. Using the Harken Truck Top Hoister, your hardtop is suspended securely from the ceiling. 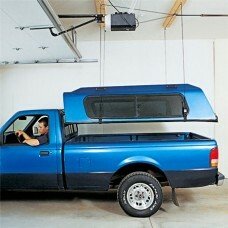 Better than other storage options because your truck cover hangs in often unused ceiling space. Mount it above your parking spot in your garage and easily remove, lift off and store your truck cap in seconds. The Harken Hoister system is designed to be easily operated by one person. Raises and lowers even heavy truck caps (up to 200 pounds) using an innovative four point design which keeps the load steady even when weight distribution of your pickup top is uneven. Self-locking safety works instantly if the rope is accidentally released. Stainless steel hardware, double-braid rope for strength, durability and long life. The best solution for truck topper removal and storage! Mount it in your garage, shop, or anywhere you can park a truck. Everything is included for quick and easy mounting and installation. Please see our videos section for online demonstrations.